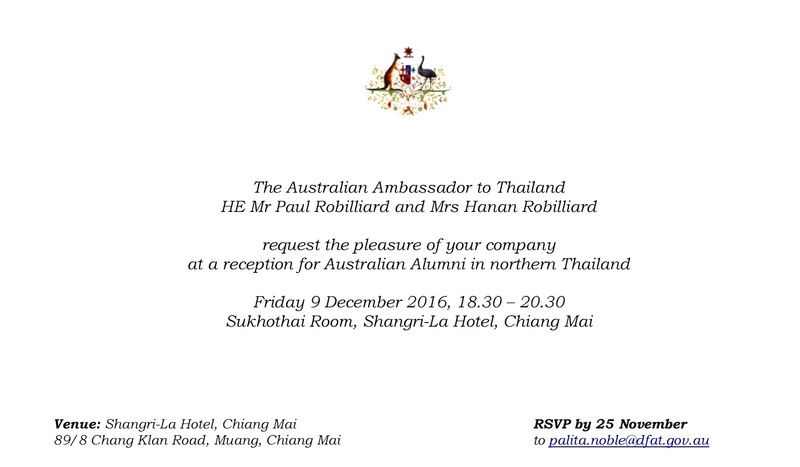 Australia had lots of representation in Chiang Mai over the period 8th -10th December 2016 for Design Week, a consular outreach visit, meeting with the Governor’s office and an Australian Alumni reception. The Australian Embassy Consular Outreach visit took place on 9th December with a visit to Immigration the day before to discuss processes. About 70 clients took advantage of the consular services that were provided at the Le Meridien Hotel. These events during Chiang Mai design week, help to foster the mission of the Alumni and Australia to Thailand. 3 Australians participated in Chiang Mia design week giving talks on their various area of expertise – an architect, a barista, an art designer giving Australian perspectives. As well as these events I accompanied the Australian Ambassador for a meeting with the Vice-Governor of Chiang Mai Province at the Provincial Hall. The Australian relationship and other topics of political and public diplomacy were discussed. The Vice-Governor also attended the evening reception to welcome guests with the Ambassador. 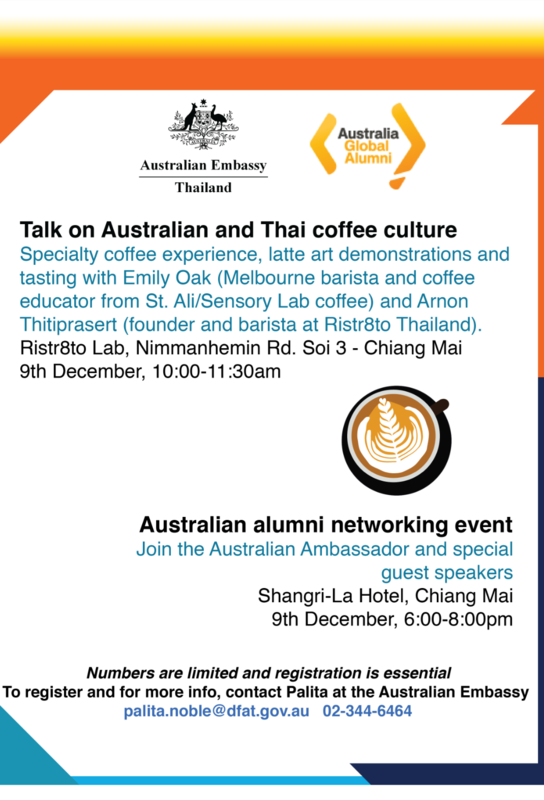 This event was held on Friday 9th December 16 at Ristr8to Lab in Nimmanhemin Rd Soi 3 – head along to this cafe for delicious coffee and cakes. Talks on coffee culture were given by Emily Oakes, a Melbourne barista and coffee educator together with Arnon Thitiprasert, founder of Ristr8to Lab and Thailand #1 barista. An amazing food and wine offering accompanied the night along with some great company and networking. Lets hope this event returns next year. Backed by the resources of the Australian – Thai Chamber of Commerce with strong support from the Australian Embassy in Bangkok and working with university alumni related organisations in Thailand, Australian Alumni provides a platform for connecting the community of Australian graduates and recognising their personal and professional achievements.